The Salus Approach provides practitioners with a method to help couples improve their empathic communication. Practitioners will learn to work with couples, assisting them to improve their understanding of their relational dynamics, to develop the skills to navigate and decrease patterns of dysfunction, and to improve their communication, reconnect, and increase relationship satisfaction. The efficacy of couple’s therapy is well established; both when working with individual relationship issues and in the context of a presenting couple. However, the foundational skills for working with couples are typically taught as an augmentation to the clinical focus of training courses. 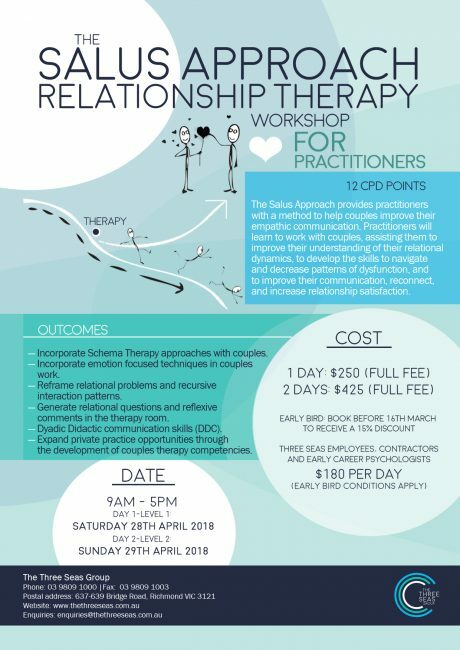 Focused on the development of specific relationship focused competencies, this experiential workshop will teach aspiring/existing couples therapists evidence-based relationship counselling skills in order to facilitate the process of change within relationships. Practitioners will gain a greater understanding of the common relational stresses that couples experience, whilst also learning the professional and reflective capabilities to work with couples in distress, and to assist them to develop the skills required to navigate and overcome decline in relational satisfaction. Since running our first Salus Approach workshop in 2017, which was a success, and receiving feedback, delivery of the workshop has been modified to further enhance and improve practitioners learning experiences and their understanding of the Salus Approach. The training has now been divided into two separate workshops, which now includes one full day of intensive “Dyadic Didactic communication skills” (DDC) training, requested by many practitioners who attended our previous workshop. Day 1/Level 1 will consist of an introduction to the manualised Salus Approach, familiarising practitioners with concepts, research and theories relevant to the approach. This will also demonstrate to practitioners the structure of, and how they may deliver the manualised Salus Approach to couples, during couples therapy. Day 2/Level 2 will consist of, one full day of intensive training in Dyadic Didactic communication skills (DDC). This is a unique skill to the Salus Approach. Therefore, practitioners will have multiple opportunities to develop their confidence and skills in delivering and guiding DDC. Experienced practitioners will live role-play DDC in action, while participating practitioners will also partaking in group role-plays, practicing DDC themselves, and receiving on the spot feedback and guidance from experienced practitioners. Robert’s working experience as a tradesman ‘building things’ and as a farmer ‘producing things’ and his subsequent academic qualifications in Organisational Psychology set the background for the development of his unique approach to couples therapy. Working with over 500 couples and drawing on theories and practice across attachment, conflict and change management, communication, schema, motivation, and emotion focused fields, Robert has established a process/behavioural driven approach to couples therapy that is active, engaging, empathic and provoking. After many requests, Robert has, with help, manualised and packaged his approach to couples therapy, with the hope that other therapists find his Salus Relationship Therapy as helpful and rewarding as he and his clients have. Practitioners may choose to attend both days/levels, or choose to attend just one day/level. Please note: Practitioners who previously completed the level 1 introduction Salus Approach course in August 2017, are now eligible to see couples clients at the Three Seas Group.